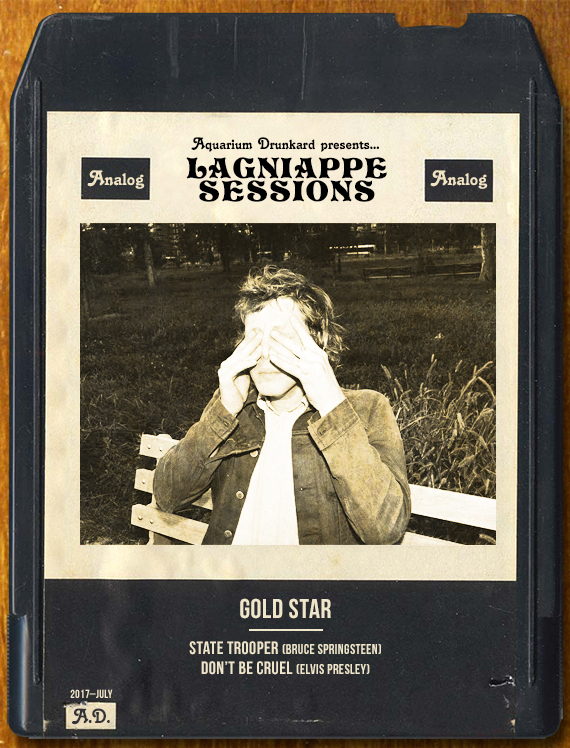 This week’s installment of the Lagniappe Sessions catches up with the Los Angeles-based Gold Star – the songwriting/performance vehicle of Marlon Rabenreither. Bathed in reverb, Rabenreither lays down a Billy Swan inspired take of the King’s “Don’t Be Cruel” along with the Springsteen lo-fi gold that is Nebraska‘s “State Trooper”. The artist in his own words, below. “Don’t Be Cruel” was a #1 hit for Elvis Presley in 1956, but the version of the song that really interests me was Billy Swan’s 1975 rendition of the Brill Building classic. Swan’s version is remarkably slow and completely alters the emotion of the original, essentially doubling its run time even while cutting out bridge and chorus. A fascinating arrangement, Swan’s “Don’t Be Cruel” demonstrates a great deal of restraint on behalf of the players involved. Thanks to Mike Post at Moose Cat Recording Studio and Tripp Beam, Jeff McElroy, Matt LaRocca, Fred Garbutt, and Dan Wistrom for playing them with me. The killing spree song off Nebraska is the song “Nebraska” about Charlie Starkweather, not “State Trooper.” I don’t see “State Trooper” referencing killing, and specifically mentions Jersey, not the midwest.